Diwali, the Hindu festival of light, is supposed to be a time of religious celebration each fall. Candles are lit and temples glow as worshippers rejoice over a five-day period. But the celebrations have a slightly different feel this year in India’s capital city, New Delhi. The Supreme Court has imposed restrictions on the customary use of firecrackers in order to combat high levels of pollution, according to The Associated Press. 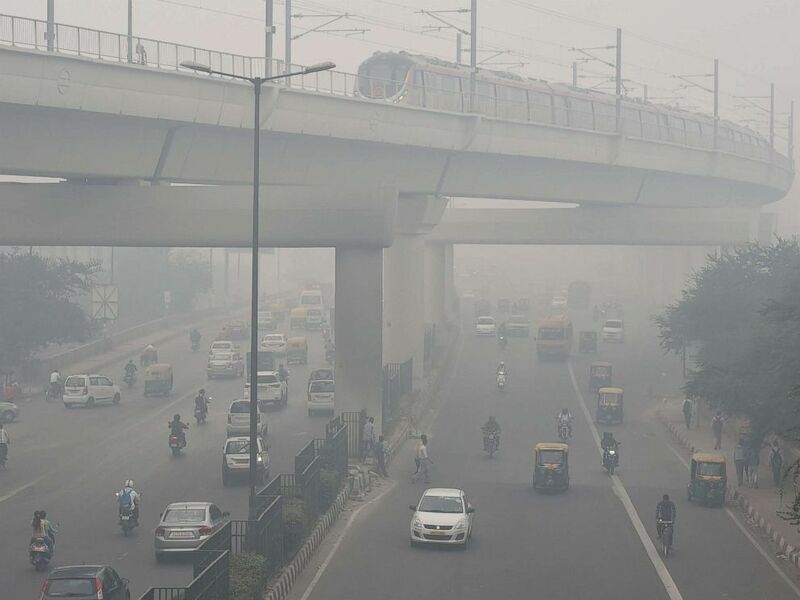 A Delhi Metro train and vehicles drive past heavy smog in New Delhi, Nov. 5, 2018. A potentially deadly cloud of smog looks set to disrupt the festival this Wednesday, with activists and scientists warning that rising rates of air pollution are sparking a citywide emergency. The Air Quality Index for India has reported that New Delhi is experiencing the worst rates of air pollution this year. A rating of 0-to-50 on the index represents “satisfactory air quality,” and the bracket of 201-to-300 counts as “very poor”. On Monday, the city recorded air pollution levels as high as 400, which is considered hazardous for even healthy people. The adverse health effects can be experienced even during light physical activity. The central government has faced criticism for not doing enough as images of the city this week show a metropolis covered in a thick layer of smog. 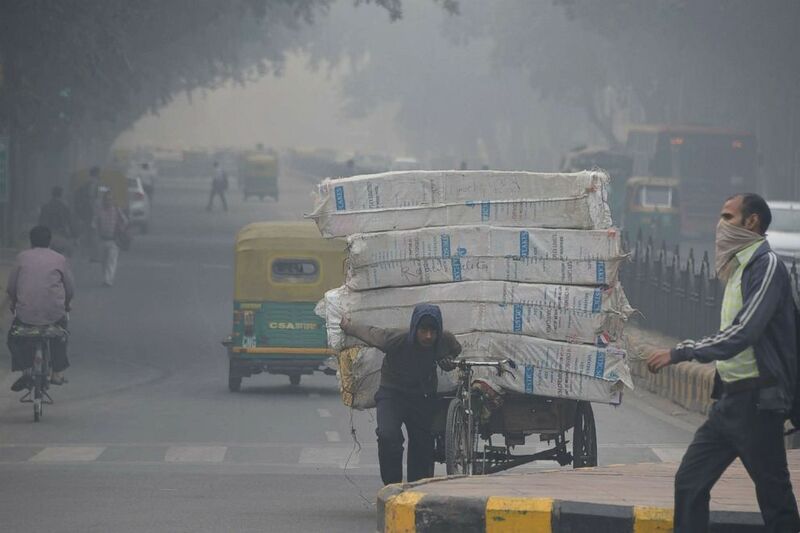 Sunil Dahiya, senior campaigner at Greenpeace India, told ABC News that although the end of the monsoon season this time of year brings a spike in air pollution, the problems New Delhi faces are a long time in the making. “Continuous sources of pollution – industry, power plants, the way transport is, the way our waste management is” are the “four or five consistent sources of pollution are [there] all around the year,” he says. The levels of pollution are “definitely” a danger to the public health, said Dahiya. Although the government response is definitely better than the last few years, due to the establishment of the government-run National Clean Air Program, “the solution to the problem cannot be just in reacting when the problem is beyond control,” he said. 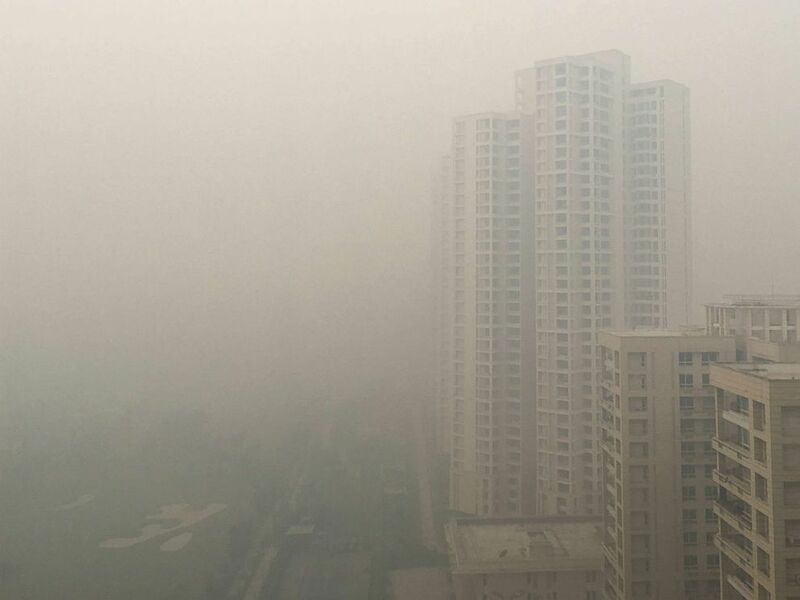 And Twitter users were quick to take their own pictures of the poor visibility in the city, such as this view from the Jawaharlal Nehru University in South Delhi. As early as 2015, the Delhi High Court observed “it seems like we are living in a gas chamber” over the regional government’s failure to act on air pollution, according to the Indian Express. Residential buildings are seen in smog in Noida on the outskirts of New Delhi, India, Nov. 5, 2018. Harsh Vardhan, minister for environment, forests and climate change, merely tweeted that people should "keep #AirPollution in mind while decorating your home this #Diwali." Doctors have repeatedly warned this week that the current levels of pollution are having a severe impact on people’s well-being. "The impact of the foul air on public health can be compared to smoking 15 to 20 cigarettes a day,” Dr. Arvin Kumar of the Lung Care Foundation told the Times of India. An Indian man with his face covered walks amid heavy smog along a street in New Delhi, Nov. 5, 2018. With Diwali looming, there is no quick fix to the significant challenges the city faces. “This winter may be a political turning point," she added, "as the outcry rises across heavily polluted cities."